Karl reMarks: God is of Lebanese Origin! Omar Sharif, Mika, Salma Hayek, Terrence Malick, Paul Anka, and many many others are all international celebrities of Lebanese origin. But those big names are about to be eclipsed by the biggest personality of them all – God! According to the findings of a recent extensive investigation, God is also of Lebanese origin, a revelation that is bound to shock the world and increase the Lebanese people’s pride in their country. The investigation was carried out by the Lebanese Centre for the Discovery of Celebrities of Lebanese Origin, (LCDCLO), one of the most trusted organisations in the world in the field of tracing celebrities of Lebanese origin. The Beirut-based organisation employed a team of researchers over a period of five years and they were able to prove beyond doubt that God is indeed of Lebanese origin. Although not much is known of God’s early days there were clues in religious texts to His background. For example the name of God in Phoenician is ‘El’ which is a Phoenician word and therefore a strong indication that He was Phoenician. The Arabic name for God is ‘Allah’ which is part of the common Lebanese expression ‘inshallah’, hinting strongly at a connection between the two. Even in English, the word God sounds like the word God in the Lebanese dialect popular among teenagers in coastal cities. Furthermore, historical research revealed that Eden is most likely to be the Lebanese town of Ehden, which explains why the townsfolk refer to God as one of them. The link is so strong that it is widely expected that famous Lebanese writer Nassim Nicholas Taleb, author of the influential book The Black Swan, would certainly endorse it. Taleb has emerged as a unique thinker in recent years and his authority is unparalleled. On a less scientific level but no less authoritative, it is widely known that Lebanon has unmatched natural beauty, as if God wanted to give it that little bit extra to celebrate his place of origin. Lebanon’s scenic nature, mountains and sea are famed across the world, a fact that is proven by how many times it places on the top of polls to determine which countries are the most beautiful. Another crucial piece of evidence is a bit of Lebanese folklore that is popular in traditional songs which goes ‘Lebanon is a piece of the sky’. Historians hired by the LCDCLO confirmed that this is proof of the connection between God and Lebanon, it has survived in the language for thousands of years as evidence of the connection between the Divine Being and his place of origin. The Israeli lobby tried its best to discredit these important findings, arguing that in fact God clearly came from the land of Israel, as stated in the Bible which is the oldest monotheistic text. 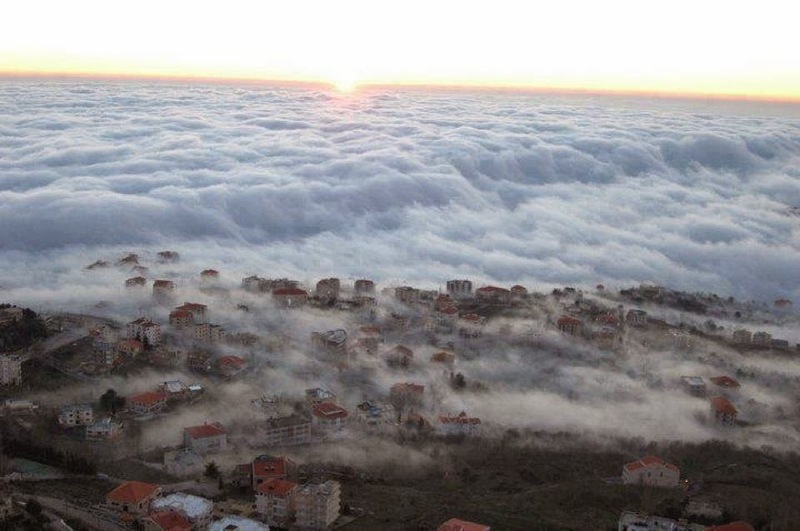 However a famous Lebanese poet refuted the Israeli claims and argued that since the mountains of Lebanon are the tallest in the region, they would have been God’s natural choice. The news was met with massive celebrations in Lebanon, helping lift the gloomy mood in the country. Many people stated that they were not surprised because they always expected this to be the case, citing Lebanon’s divine beauty as clear proof. Many said their desire to emigrate was primarily because they didn’t deserve to live in God’s own country. The mood of celebration was slightly soured however by clashes among Lebanese of different factions as to what the real sect of God is. In certain parts of the country the clashes descended into armed skirmishes in which light weapons were used. The upside however is only the real people of God could feel so passionately about Him.